The versatility of the PanaVise product line is evident in this combination: it's simply the 366 Wide Opening Head with the 300 Standard Base. This provides a wide gripping head with the full "tilt, turn and rotate" capabilities of the split ball (found in every 300 and 400 series base). The 396 Wide Opening Head PanaVise stands 7 5/16" (185.7mm) tall and weighs 3lbs. (1.4kgs). 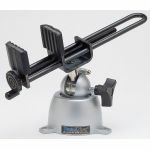 Purchase Panavise Vise Combinations and Accessories sold by Howard Electronics Today!